With a holiday designed to let your creative energy flow, this Tuesday put another Wake Forest Halloween is in the books. Costume-wearers could be spotted on campus all week, but Tuesday marked the pinacle of festivities. Some costumes were scary, others cute and some even incorporated duos. No matter your costume preference, Halloween is a time for Deacs to express their styles more than ever. We loved all the costumes, and took note of a few. For starters, Sophie Hollis and Caroline Li made this year’s “hot” list with their fun fire duo costume. Halloween is a great night to spend with friends, and these two dressed for the occasion. 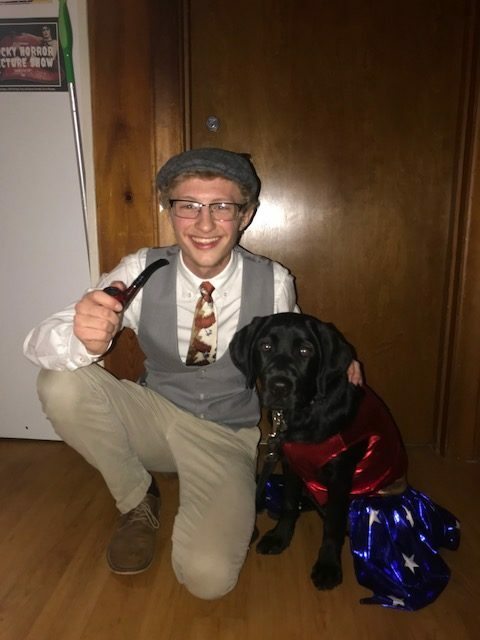 Another dynamic duo we noticed was Rance Orell and his “wonder”ful pup, Lavender. Orell recently founded the Young Democratic Socialist of America chapter at Wake Forest, so his costume definitely spoke to his interests. We loved the unique idea. In the pop culture category, Lucy Shen sported her Stranger Things cotume around campus for all of Halloween. We tracked her down in ZSR carrying her cardboard Eggos to complete the costume. Finally, our last Halloween feature proves that costumes can have class. Brady O’Saile’s FYS class was offered extra credit for dressing as historical figures this year. With this polished George Washington costume, we think that O’Saile absolutely earned an “A”.